The ride down County Road 29 is nothing spectacular, but what you find at the end is a little piece of history. The first time I made the trip to Gee’s Bend, Alabama was on December 26th, 2004. My mother and I drove up in her big, white truck. The only way to get to Gee’s Bend is by traveling the small country roads that run like veins through Alabama. In many ways, little has changed over the years: there are cotton fields, sharecropper shacks, and old Antebellum homes. We were on our way to Mary Lee Bendolph’s house where the famed Gee’s Bend quilters had gathered so that I could interview them for a play I was writing. Most of the houses in Gee’s Bend were built by the Roosevelt administration as part of the New Deal. After a particularly desperate winter in 1932, when residents almost starved to death, the Roosevelt administration bought the land from the original plantation and sold it back to members of the community with low interests loans. They got a house, a smoke house, and a barn. There was lowland for cotton and upland for corn. What it created was a community of African-American landowners, which was almost unheard of in the segregated South. Gee’s Bend was written about in the New York Times and photographed by Arthur Rothstein and Marion Post Wolcott, and for a brief moment, Gee’s Bend became a place that people talked about. Gee’s Bend sits on the banks of the Alabama river. Many of the residents still bear the name Pettway, a reminder of the plantation owner who walked 100 slaves to Alabama in the winter of 1845. To get to Camden, the county seat, the Benders traveled by ferry. It was really no more than a flat bottom skiff, but it saved them the hour drive around the bend. The community found the spotlight again when they became active in the Civil Rights Movement. Being landowners gave them power; no one could threaten to kick them off their land. Civil Rights leaders would gather there and Martin Luther King even made a pilgrimage to the Bend. But the 1960’s were a turbulent time and in order to keep people from Gee’s Bend from voting, the white community in Camden cut off the ferry service. At the time, Sherriff Lummie Jenkins was quoted as saying, “We didn’t cut off the ferry cause they were black. We cut it off because they forgot they were black.” The ferry didn’t return until 2006. Mary Lee is one of the famed Gee’s Bend quilters. Their work has been called by the New York Times as one of the greatest collections of American folk art in history. 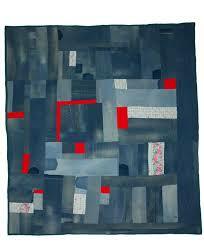 But the quilters didn’t intend for their quilts to be seen as art. They made their quilts because they were trying to keep their families warm. 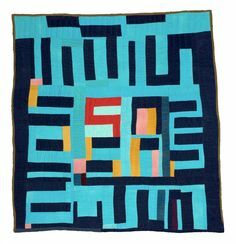 You can follow the history of the rural south through the textiles they incorporated into the quilts: work clothes, flour sacks, denim. 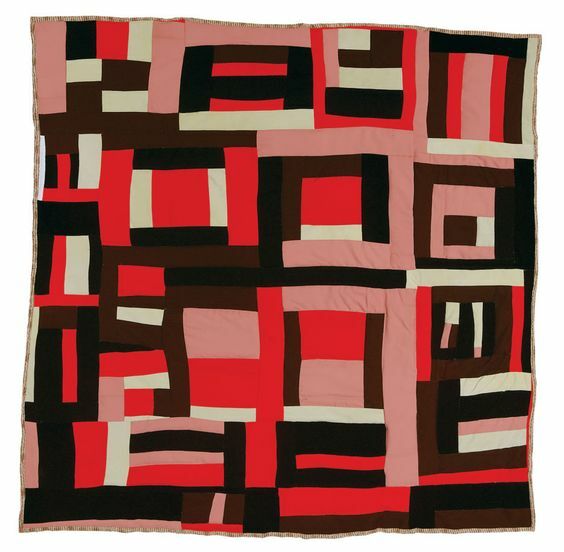 When many of the women began working at the Sears Factory in the 1960’s and 70’s quilts were often made from vibrant corduroy scraps they were allowed to take home. Women usually pieced their quilts together by themselves, but when it was time to quilt it, the process became a communal event. They would sit around singing and praying. In this community, God and music are inseparable. I spent six months doing research before I ever wrote a word. There were hours at the library and more trips to Gee’s Bend. 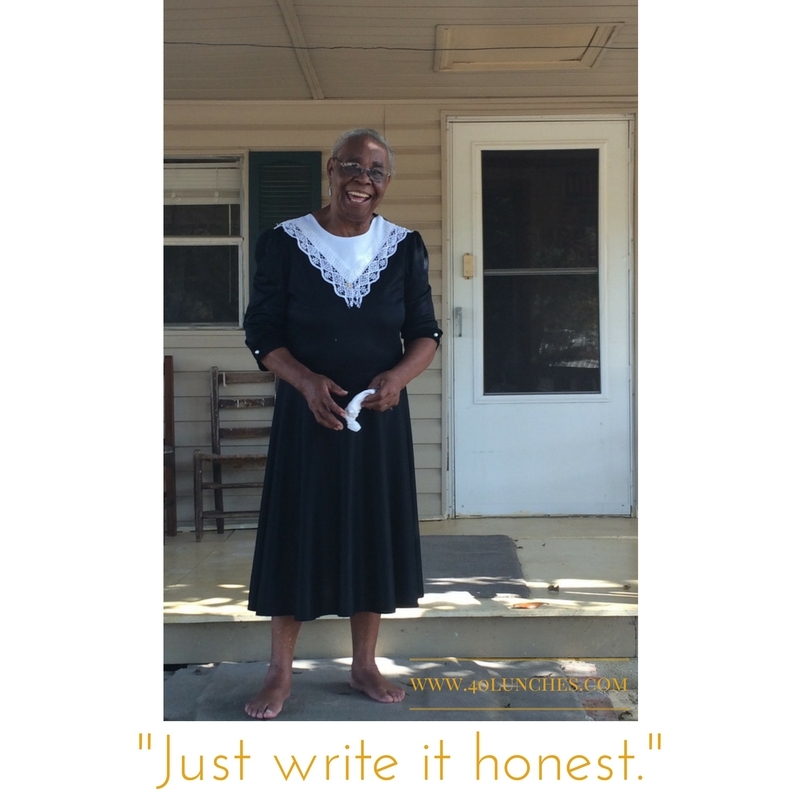 I was writing about real people and I felt an obligation to tell the story with honesty and integrity. The play was never meant to be the story of one particular person, but Miss Mary Lee is the one who repeatedly opened her home to me and always took the time to answer my questions when I called. She became ingrained in the story I was telling and for that I am grateful. We still exchange cards and the occasional phone call, but I’m not as diligent as I should be. She suffered a minor stroke since my first trip to the Bend and continues to struggle with her health. Her daughter cooks for her each day. For this lunch, I decide to take my daughter. She has grown up hearing stories from Gee’s Bend, and as she learns about the Civil Rights Movement it’s a chance to introduce her to the people who were beaten on the Edmund Pettis Bridge and drank from forbidden fountains. When we arrive Miss Mary Lee hugs my neck, then reaches out her arms to my daughter. Her smile is radiant and her laugh infectious. She has our Christmas card prominently displayed along with pictures of grandchildren, great-grandchildren, and countless nieces and nephews. There is a picture Martin Luther King and Barack Obama, as well as a framed set of US Postage stamps depicting the images of some of the famed quilts. We sit on the sun porch her son built for her, the tv playing in the background. Mary Lee tells me about her grandchildren, her health, and about how she can’t travel like she used to. Because there are no restaurants in Gee’s Bend, I brought lunch with us. We sit at her kitchen table and eat. I tried to explain my 40 Lunches Project to her and tried even harder to express what a gift she has been in my life. She came into my life at a time when I was preparing to say goodbye to my mom. Her story kept me going on those dark days when I needed to be reminded that human beings have an amazing capacity for both sadness and resilience. The success of the play validated me as a writer and bought me more time to write. When the play Gee’s Bend first premiered Mary Lee was frequently in the audience. At the end of a performance, she would often take to the stage to congratulate the actors and take a bow. After all, she earned it. There’s a moment in the play where one of the characters says, “My quilts have taken me to all the places I never thought I’d see.” That’s how I feel about my play. It’s taken me all across the country. It had brought people into my life I never would have met and helped me see the world in ways I had never imaged. You can read more about Mary Lee and see examples of her work here. Have you enjoyed the 40 Lunches Project? Follow along on Facebook and share it with a friend. Thanks for your support. Thank you for this inspiring story! Wow, love this in depth piece. I had no idea who this young woman is but I'm always happy to be introduced to real life history. Thanks for sharing! Thanks for taking the time to read my work. This summer I turned 40, so I"m taking 40 people out to lunch: people who helped shape the first 40 years and people I hope will inspire the next 40. I hope you'll follow along! What a wonderful story and you write it so beautifully. I love this!